This blog is about Google Search Console how we can use it to do better things with our website. console which will help you with this. Surprised? Yes I said Goggle Search console will help you with this as it provides free service to maintain, monitor and troubleshoot your site. With the help of Google search console you can do a lot more I will tell you what and how. Confirmation that Google search can find and browse through your site. Fix indexing problems of your website. View Google Search traffic data for your website as on how often your site appears in Google Search. Which searches bring up your site, how often searchers click and more. Display what all sites link to your site. Troubleshoot on issues regarding AMP, mobile usability, other Search features etc. 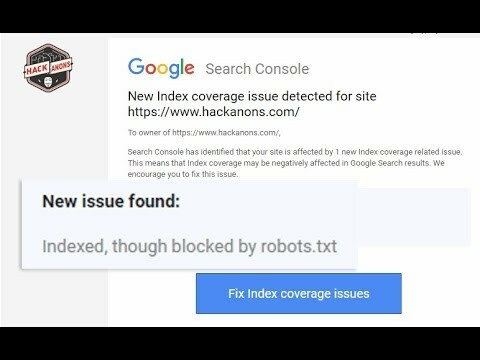 How to fix indexing coverage issues in Google Search Console ? I saw your video and read your post related to this issue but can not able to resolve this issue, Kindly help me in this regard.